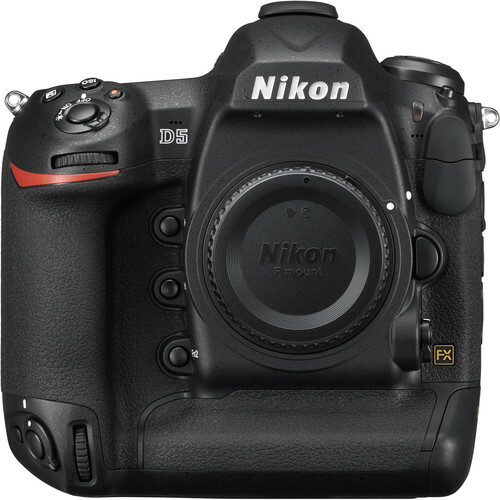 Qualifying itself as the flagship model in Nikon's DSLR lineup, the D5 is positioned as a truly fast, highly precise machine for professional photographers. Revolving around a full-frame, FX-format 20.8MP CMOS sensor and EXPEED 5 image processor, this workhorse touts an impressive 12 fps continuous shooting rate with full-time AF and AE, an expandable sensitivity range that goes up to ISO 3280000, and 4K UHD video recording at 30 fps. Matching the imaging versatility, the Nikon D5 is also characterized by its redeveloped Multi-CAM 20K 153-point AF system, which incorporates 99 cross-type sensors for refined precision when tracking moving subjects or working in difficult lighting conditions. This model features dual CF memory card slots, to provide versatility in file handling during shooting, and a range of selectable raw file sizes can also be used depending on output needs. Designed to keep up with the fastest subjects and handle the most difficult working conditions, the Nikon D5 is an advanced DSLR well-suited to the most extreme multimedia workflows. This model of the D5 is configured with two CF card slots, allowing you to extend file saving capabilities by permitting overflow recording, in-camera file duplicating, or the ability to segregate raw and JPEG files between the two cards.